At Large: Teen Bandit. Even Larger: His Legend. Colton Harris-Moore has been on the run for 20 months and is being touted as a modern-day Jesse James. Police say the young outlaw is an amateur criminal -- but a master escape artist. He's likely one of the only criminals with 16,000 members on his Facebook fan page. At Large: Teen Bandit. Even Larger: His Legend. 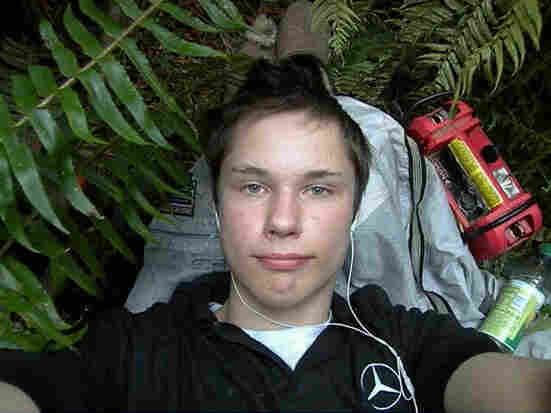 Colton Harris-Moore took this photo of himself on a stolen digital camera. A teen bandit from the small Washington island of Camano has been on the run for 20 months and is being touted as a modern-day Jesse James. Police say the young outlaw is an amateur criminal -- but a master escape artist. The last time authorities had Colton Harris-Moore in custody was in April 2008. At that point, he was serving time in a halfway house for youth offenders, just south of Seattle. He'd been convicted of theft and possession of stolen property. It was bed-check and he was in his pajamas. But soon after the nightly routine, he climbed out a second-story window and into the night. Since then, the now-18-year-old fugitive has eluded police in Washington, Idaho and Canada, repeatedly vanishing into the woods. Police suspect he's stolen at least two planes, two boats and several cars, plus broken into more than 50 homes. Yet the only thing growing faster than Harris-Moore's alleged rap sheet is his legend. "I don't understand it, myself," says county sheriff Mark Brown. He bristles at the mention of Harris-Moore's exploding popularity. "Reasonable people would not want to idolize somebody or sensationalize somebody who's a thief," he says. Harris-Moore is wanted in five counties on multiple charges. But 10 of those charges are in Harris-Moore's hometown of Camano Island -- Brown's jurisdiction. Over the years, police say Harris-Moore has evolved from a petty thief stealing food and blankets, to what he is today -- a convicted felon on the run. During a recent appearance on a local Seattle radio show, Harris-Moore's mother, Pamela Kohler, said she has no idea where her son is hiding. "And I like it like that, because that way I don't have any information to give to the police," she said. Kohler says she's writing a book about her son's exploits. She plans to use the profits to open an animal shelter for abused pets, something she says her son had dreamed of doing. Kohler also claims he's a genius. "He took an IQ test a few years ago and he's three points below Einstein," she says. "And if he flew those planes without lessons. I am very, very proud." Adin Stevens is also rooting for the runaway. And not just because Stephens sells T-shirts bearing Harris-Moore's picture for $15 each. But he's not a boy only a mother can love. He has a growing legion of fans -- and not just locally. Harris-Moore's fame reaches far beyond the small Puget Sound community where he is accused of invading homes and stealing credit cards. Feelings about Harris-Moore run the gamut from locals who are tired of the story -- and of answering reporters' questions -- to fierce fans enamored with the growing myth. People have even written songs. The lyrics to "The Ballad of Barefoot Harris" read, "But he'd never hurt a fly, and he'd never kill a man, and he never will be found." Fans as far away as Greece, Italy and Australia extend open-door invitations through the magic of Facebook. To date, there are more than 16,000 members of a fan page for Harris-Moore. Girls, taken by his almond-shaped blue eyes, beg him to visit their homes and offer to be his girlfriend. Guys mock the law enforcement agencies who have failed to capture the 6-foot-5, 210-pound teen. Aidin Stephens is also rooting for the runaway. 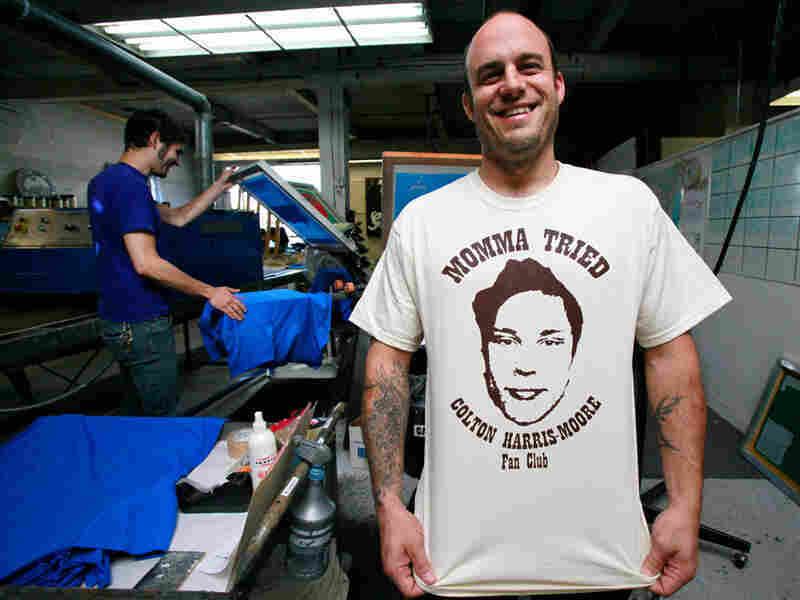 And not just because Stephens sells T-shirts bearing Harris-Moore's picture for $15 each. "Being good doesn't really get you very far," Stephens says. "It's a kind of a sucker's swindle." "There's haves and have-nots in the world, and whether he's a mastermind or not, he obviously was never going to have the kind of opportunities that some people might have to have a Mercedes or to be a pilot," Stephens says. "I mean, it's an expensive hobby to have an airplane." Nobody knows that better than Bob Rivers, whose plane was worth $150,000. That was before Harris-Moore allegedly stole it -- then then totaled, it. It took police almost a year to link Rivers' 4-seater Cessna to the wanted teen. But despite their assertions, Rivers, a Seattle host for CBS Radio, is not entirely convinced Harris-Moore is really responsible. And he's reluctant to add to the fugitive's growing legend. "There's a saying in aviation: There are old pilots and there are bold pilots, but there are no old, bold pilots," Rivers says. "Colton has clearly done some bold things, but could he learn to fly on the Internet and then crash-land several planes in a row, in rugged terrain, and walk away each time without a scratch?" The story -- if true -- is what makes Harris-Moore's life the stuff movies are made of. Just last month, a documentary film crew landed on Camano Island to interview locals. A slew of production companies are courting Kohler for access to her son. Of course, this isn't a movie. With each new crime that's attributed to the teen, the stakes get higher and the potential for a dangerous confrontation increases. Authorities and Harris-Moore's mother are hoping for the least cinematic ending -- the one where the 18-year-old quietly turns himself in.